Ongava Tented Camp is a small classic traditional tented camp. Guests sleep in "Meru" tents which are the classic East African style of tent. Each tent has double doors to allow for uninterrupted views of the bush and waterhole in front of camp and every tent has its own covered verandah. The tents have been tastefully furnished, each with its own en-suite thatched bathroom with flush toilet and unique open air private shower. There are six guest rooms at the camp, including a family room. The bar and dining area is built out of rock and thatch and has an intimate feel. Drinks and dinner can be enjoyed around the open air fire place and swimming pool, both of which overlook a productive, floodlit waterhole situated at eye level in front of the camp. Situated along the southern boundary of the Etosha National Park, close to the Anderssen Gate in northern Namibia. South of Okaukuejo. 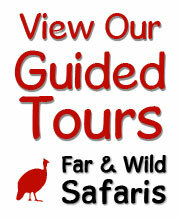 In our own 30 000-hectare (65 000-acre) private game reserve.